Fockea edulis is a cauciciform vine, with a tuber that may reach up to 12 inches in diameter in cultivation. It is said that the Hottentots used to eat the tuber. It is a native of South Africa. Blooming Time: Summer. Flowers are green about ½ inch wide, not very showy, but lightly scented. Culture: Fockea edulis needs full sun to light shade. The tuber should always be shaded. In the greenhouse we use a soil mix consisting of 1 part peat moss to 1 part loam to 2 parts sand. Water regularly in summer and water only enough to keep the tuber from shriveling in winter. It is deciduous and all foliage will be lost in the winter dormancy period. Since it is a vine, some type of support is needed. Propagation: Fockea edulis is best propagated from seed. We have had limited success with cuttings. 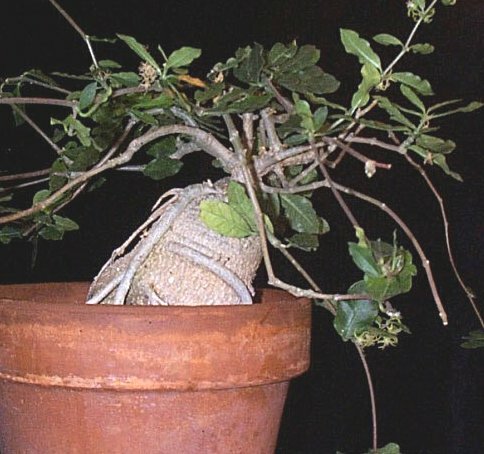 Fockea edulis was featured as Plant of the Week September 15-21, 2000.